Messi to be rested and left out of Barcelona squad in today's La Liga match against Huesca due to the upcoming UCL fixture. Barcelona will be facing Manchester United in the most crucial second leg of Uefa Champions League on Tuesday. Though they have got an important away goal and chances of United beating them are quite narrow, coach Ernesto Valverde is taking no chances on that. As a consequence, he has rested his most significant player Messi on Match Day 32 against Huesca. Alongside Lionel Messi, the defensive midfielder Sergio Busquets shall also be left out of the squad. 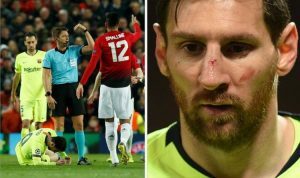 Leo Messi also suffered an injury against Manchester United in the first leg where after a collision with Chris Smalling, he was seen bleeding from his left eye and the deviation of Nasal Septum has also been reported. Should benching Messi impact Barcelona La Liga progress? Currently, on La Liga table, Barcelona is 11 points clear of Atletico Madrid and 13 points ahead of their archrivals Real Madrid. As far as their opponent is concerned, Huesca isn’t quite a tough competitor and with players like Coutinho, Suarez, and Dembele leading at the front, there are fewer chances of Barca losing against them. Even if they do lose or draw against Huesca, their progress in the league wouldn’t hurt too much. However, the chances of that are quite slim. Also, after Lionel Messi joins the squad on next week, they shall be able to recover the chemistry. Messi’s match rating against Manchester United on Wednesday was 6 out of 10. However, he produced the assist for the only goal scored in the match. Also, being put down badly by Chris Smalling, he continued to play the complete 90 minutes after getting a bit of first aid.